Because revision, when done well, is all about carving away. Cutting. Hacking. Slicing. Without mercy. You have to cut and cut and cut until you get down to the thudding heart of what you’re trying to say. Then, and only then, do you add anything back in. 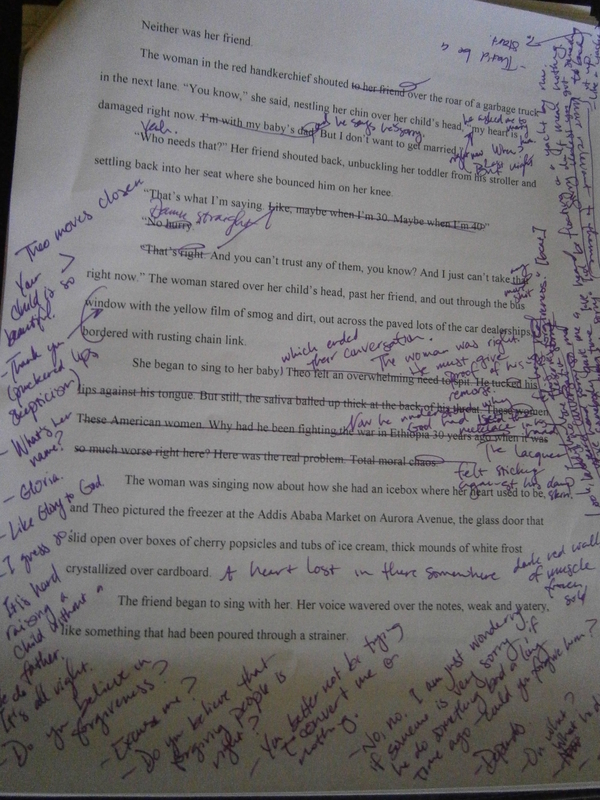 I’ve lately been deep into revisions with the short story I photographed above. I love to compare the writing process to making pottery or sculpture. The first drafts are simply the act of making clay, of piling it onto the wheel. Only after you’ve got pages of notes and a complete first draft can you start the real work. The sculpting. I’ve been told writers hate cutting. But I find it liberating. Find out what you need to say. Cut the rest. Then say it. Simple enough. It just takes consistent, dedicated practice. And that page I covered with notes in my last draft?